full time, permanent, entry level job – no experience necessary! -Clean -up & maintenance as directed. -Understand and adhere to safety requirements*Note: Individuals will be required to do repetitive lifting and work outdoors in all weather conditions. 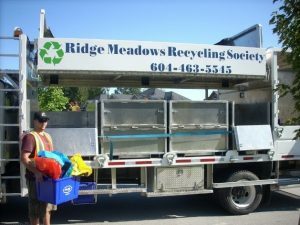 The successful applicant will be required to undergo a criminal records check.Send resume & cover letter via email to Kim Day, Executive Director, at kim@rmrecycling.orgApplications & resumes can be also submitted in person at the Ridge Meadows Recycling Society office, 10092 – 236th Street (at the Maple Ridge Recycling Depot office), or by fax to 604-467-6100.